The weather has been crummy last week in Manila. While the cooler temperature is a much welcome relief from the sweltering tropical heat, rain isn’t what I want when I’m spending the day outdoors. 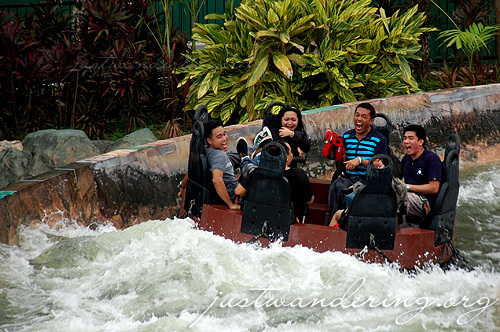 But as Eric, Rotch, Rael and I found out, the rain doesn’t stop the fun and activities at Enchanted Kingdom (though it did stop most of the rides). Neither did we need the rain to get thoroughly soaked. Upon Ms. Myla’s invitation, we found ourselves headed south to Sta. 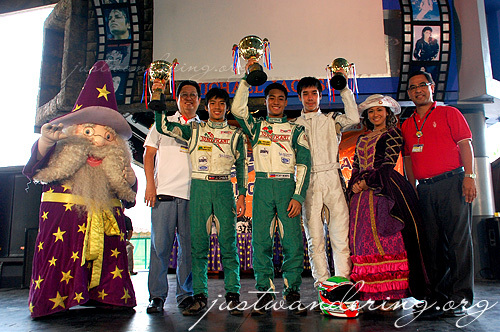 Rosa, Laguna once more to check out Speed Month at Enchanted Kingdom. For the entire month of August, the park is the venue for races and activities geared to pump the gas and adrenaline of all race enthusiasts of all ages. 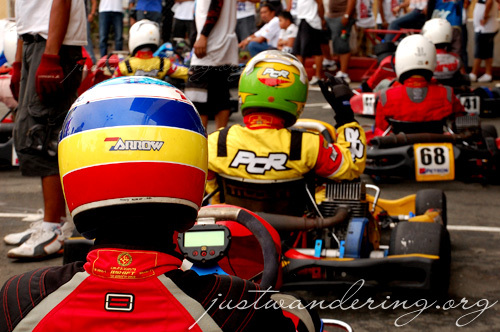 The 5th leg of the Magnolia Karting Series was one of the first racing events held at the theme park’s Kart Trak. Karters from the Formula SL Novice, Expert, Heavy, Cadet 60CC and Mini-Rok divisions were present, vying for the top positions. I knew we were there to watch the races, but I wasn’t expecting to see kids! There were plenty of adults milling around — tinkering with the go karts, giving pep talks, showing support, but none were driving. 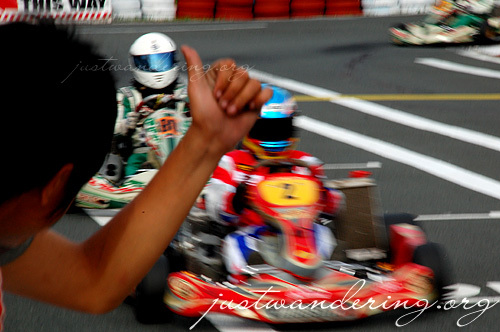 Kids as young as 7 were walking around wearing colorful racing jumpsuits, whizzing by in their custom-made karts. 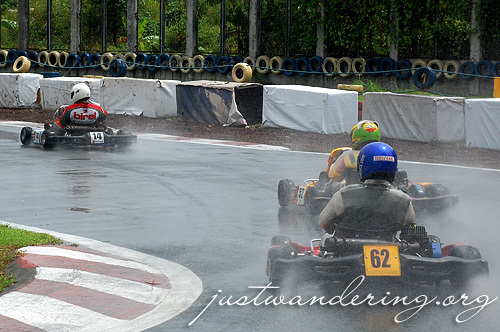 Never mind that it drizzled and eventually poured: the kids donned their raincoats over their jumpsuit while the adult change their kart’s wheels to rain tires for better traction on the wet asphalt. They roared through the tracks, spraying fine mist in their wake. In between races, we went around the park, enjoying our favorite treats and rides. I was just at the park last July with my family, so when Myla invited us back to the park, I was very hesitant to accept. I finally relented, and I dragged myself to the assembly point in Makati that Sunday morning. I felt different as soon as I stepped inside the park though. There’s really something about EK that gets you excited. All at once, I felt glad that I went. The great thing about going to Enchanted Kingdom during the rainy season is that the park is fairly deserted. Aside from the racers and their support group, there are still families and group visiting the park, there aren’t as many people. This means no lines at our favorite rides! We chanced upon the Rio Grande Rapids just after it opened at 2pm. We raced through the queue, boarding the raft less than 8 minutes upon joining the short line. The rapids ride was fun, as always. 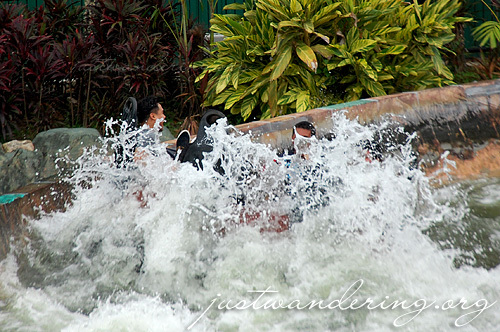 Since there weren’t a lot of people going on the ride, we queued again for another round in the rapids. We were already soaked anyway. As we were wringing out the excess water from our wet clothes, we were called back to the Kart Trak. The final races were starting. Back to the pit stop we went, angling for the best spots to take photos of the the participants as they raced through the tarmac. 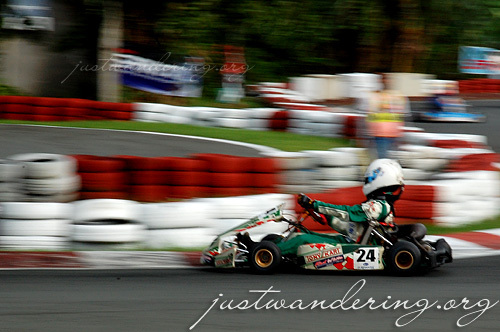 It was the perfect opportunity to practice panning, but at the same time, it was the best way to feel the excitement of the race as each young driver maneuver through each tricky turn at top speeds. 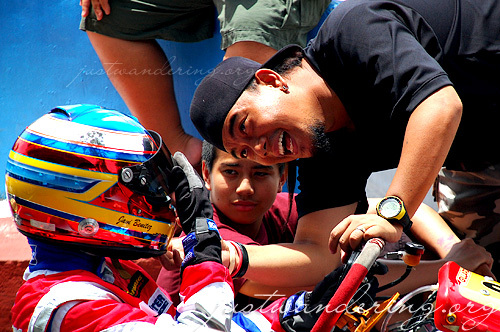 In the end, it was Roby Benito of Ready2Race who bagged the ROK Jr. and Overall class titles. When asked about his strategy, Roby attributed his win to meticulous preparation before the race, which includes a daily 5km jog on top of making sure that his grades stay above average. Pfft, kids these days. Eldar and Princess with Enchanted Kingdom’s President Mario O. Mamon & Marketing AVP Richard P. Burgos with ROK Jr. winners Joey Orduna, Roby Benito and Andres Calma. Speed Month ’09 will also feature autocross, slalom and underbone competitions plus a spectacular display of classic and customized cars in the next coming weekends. Licensed drivers can avail of EK’s Regular Day Pass at P350 by simply presenting their valid local or international driver’s license the whole month of August. Huge thanks to Ms. Myla of Enchanted Kingdom for the invite, and to Ms. Claire for the opportunity to meet the Ready2Race team.